Waterproof! Tear Proof! They Float! 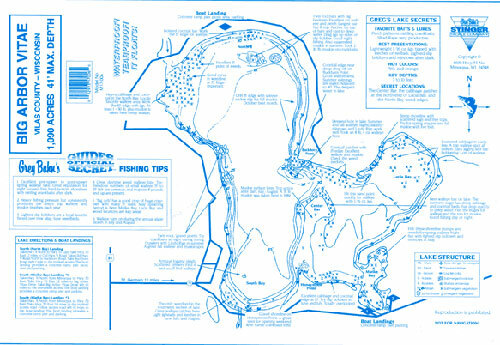 Greg Bohn's Guides Secret Lake Maps available for the first time! Get your updated fishing map information from someone who makes his living on these waters, everyday, 175 days a year! Greg has compiled over 40-yrs of full time guiding experience on many Northwoods Lakes of Vilas & Oneida counties in Wisconsin. The lake history, knowledge, secret locations, information, tackle tips, and presentation techniques are valuable tools to improve your fish catching success! Easy to read and jam packed with productive fishing locations. Greg Bohn's Official Guides Secret Lake Map Series will improve your walleye fishing success! Don't fish the Northwoods without one. Choose your map selections today!